It’s hard to believe that Tales of Vesperia saw the light more than ten years ago on the Xbox 360, with the PlayStation 3 version following the year after that. The game proved to be a huge success and many gamers who played the original will probably still have very fond memories of their experience. 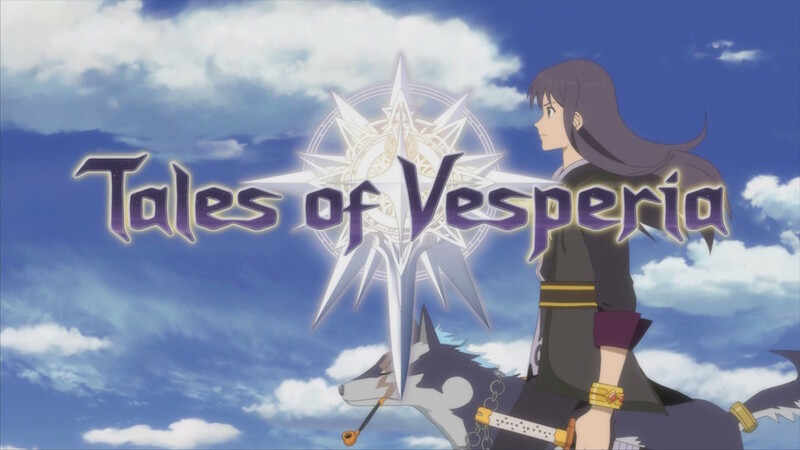 With the ‘Tales’ series getting new entries more than often, it was quite a surprise to hear news about the Definitive Edition of Tales of Vesperia a decade after the game came out. Of course this probably has to do with the fact that many popular games are getting remastered and that the Switch seems to be a viable platform for remakes and remasters as well. We were ready to once again let ourselves sink into a great classical J-RPG experience. In Tales of Vesperia we are thrown into a world that is quite dangerous and filled with monsters. To keep the human populace safe, cities have been warded with magical barriers to keep said monsters out. Of course, magic isn’t limitless and this immediately brings us to the main story of the game, which begins in the slums of one of the major cities, where the magic crystal (blastia core) is missing, which puts the waterworks of that region out of control. You, Yuri Lowell, go to the nobles’ part of the city, where you technically aren’t allowed to go, in order to find the culprit, who clearly has stolen the core. From here on out, you get arrested, meet your fellow party members and go on an adventure that’s a lot bigger than you initially expected when you went out to retrieve the stolen blastia core. Overall the story progresses nicely, and without too many side-routes things can go at a fun speed in order to keep the player occupied. 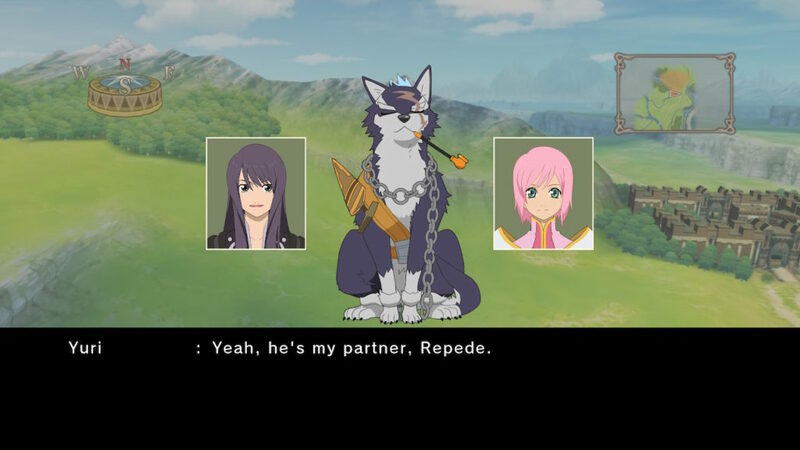 Of course, things somewhat escalate and sometimes go a bit over the top, which is common in games like this, but even after a decade, the story of Tales of Vesperia is a fun one to plow through. Even though the plot may be a bit on the simple side, compared to many other J-RPG games out there, it’s probably also the main reason why this one is liked so much in the first place. If you’re looking for some extras when it comes to the story, or at least some fun facts, you’ll have t o keep an eye out for ‘skits’. These small conversations can be triggered at specific locations when pressing the corresponding button. While these short skits don’t really add that much to the bigger plot of what is going on, they show how the characters interact with each other, often making you smile on how silly things can become. 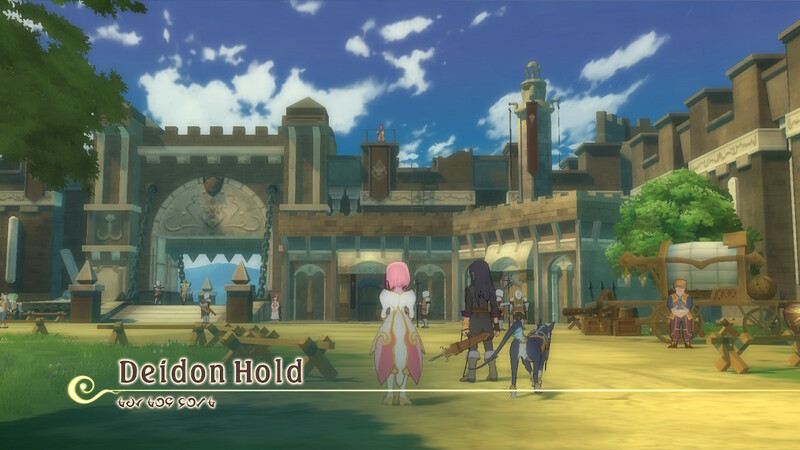 The graphical prowess of the Definitive Edition of Tales of Vesperia seems to be better than the original, but the Switch version isn’t breaking any records. The character models look crisp, with a few visible pixels here and there, all in combination with good looking environments and backgrounds, while the combat sections feel a bit empty. The latter is more a design/comfort choice for smooth combat. Overall, even if the graphics weren’t updated, this game would still possess a lot of charm due to its anime-like visuals, which are more cartoonish, allowing more leeway than a realistic style. The sound design in this Definitive Edition is superb. Not only will you have a fairly cinematic underscore, you also have the option to play the game in Japanese or English. The voice acting for both versions is quite impressively done, but those who missed the game in its native language the first time around might now be able to enjoy the ‘original’ experience if they so desire. 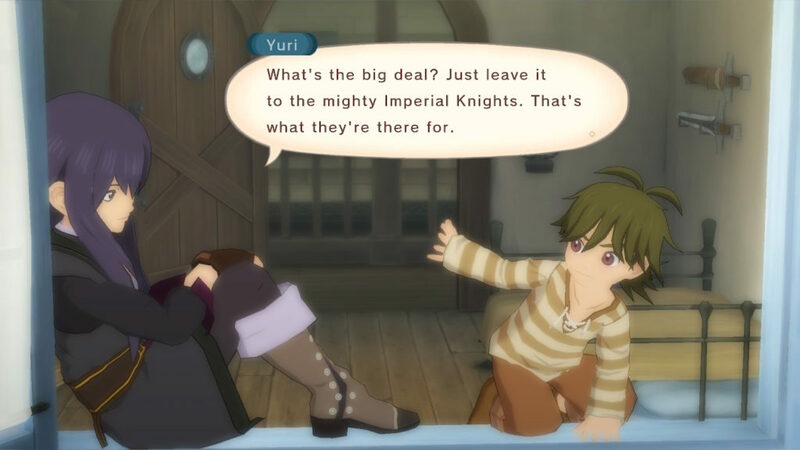 Tales of Vesperia, even in its definitive form, is a traditional J-RPG that’s all about exploring a monster-filled world in order to help the people back home. When doing so, you’ll meet new people that will eventually join your cause, or are simply headed in the same direction. The game is pretty standard in terms of story and combat, but the latter steps away from the traditional turn based format that was still fairly popular and common at the time the original version was released. 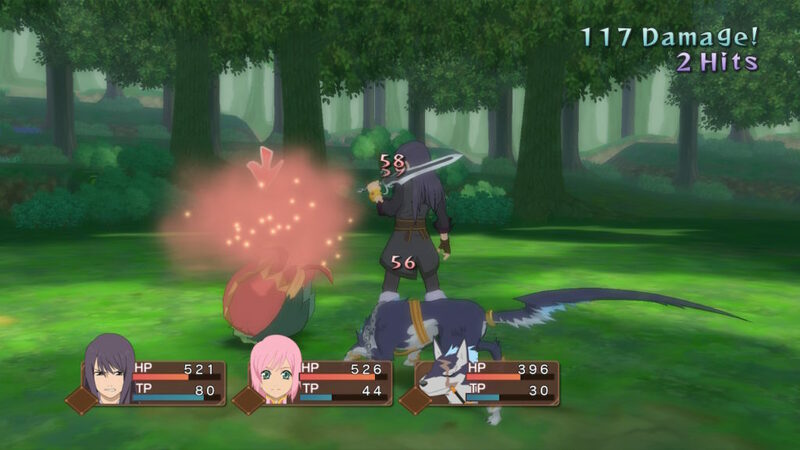 Initiating combat in ToV is done in a standard way of running into a fightable character on the overworld or in the actual levels. Touching said character will start a combat sequence which shies away from the traditional turn based format which was common back in the day. You’ll be thrown into a small enclosed area, in which you can move in all directions (when holding the proper button) and you can also attack freely, while opting to move special moves or not. At the beginning of the game you’ll have to fend for yourself, but as the game progresses your party will thicken and thus you’ll have allies in combat. All other characters will act on their own, which means that you’ll have to succumb to the whim(s) of your party members as being stun-locked without any aid from your allies is nothing uncommon in this title. While we loved the free flow of the combat, it can also be quite annoying when stuck in the middle of a few monsters, being hit constantly with no possible escape. Be sure to save regularly, as dying might cause you to lose some progress. Exploring the world is done in a fairly free fashion, but you’ll notice the actual game is somewhat linear. This isn’t a bad thing per se, but the game has slightly less options to discover special items or sequences compared to other games in the genre. Nonetheless, there is more than enough content to plow through to keep you occupied for a fairly long time. The gear system isn’t that expansive, but the skills work in an interesting fashion as some skills are stored into the weaponry you decide to equip. Even though it’s pretty much a case of trial and error which skills suit you the best, there is enough to tinker with to keep things interesting. 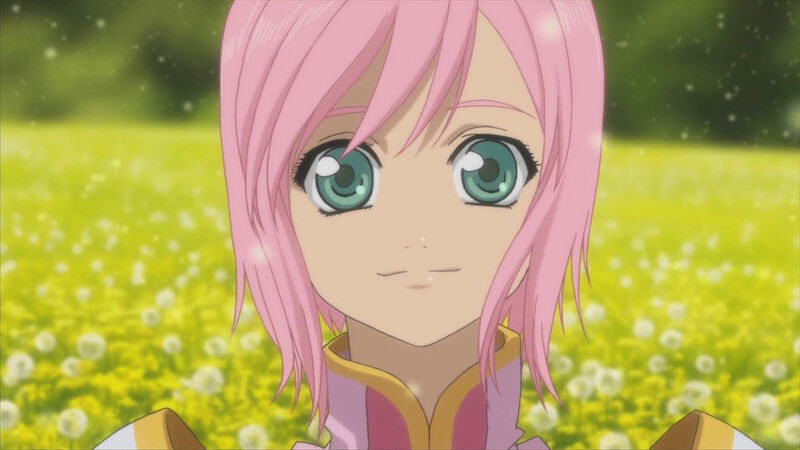 Tales of Vesperia – Definitive Edition is a great choice for gamers who weren’t able to play the original when it came out. This version includes all content that appeared on both the Xbox 360 and the PlayStation 3, ensuring you have the full package. You’ll be treated to a stellar J-RPG experience, with nice aesthetics, great background music and voice acting and somewhat linear but interesting gameplay. Those who already played the original version, and are still somewhat lukewarm on the idea of having to pay for a full priced release, might be best to wait a bit until the game undoubtedly drops in price.